Jodhpur is located in the western region of Rajasthan and at the edge of the Thar Desert. Jodhpur is the second largest city of the state. Wander around and explore the fascinating region with historical monuments. Learn more about the legendary past of Jodhpur with the tour of historical places ofJodhpur - Rajasthan Jodhpur. There are numerous tourist attractions of Jodhpur that has historical significances. Mehrangarh Fort is a 5 km long fort and has four gateways. The fort stands on a 125 m high hill.Built in 1899 AD, Jaswant Thada showcases the magnificent work of white marble. Cheetar Palace (Umaid Bhawan Palace) is a 20th century structure. It took 16 years to complete the construction of the palace. A part of the palace has now been converted into aheritage hotel and another part houses a museum. Girdikot and Sardar Market is one of the oldest markets of the region. You can buy colorful handicraft from here. Government Umaid Museum houses rare paintings, weapons, sculptures and artifacts. A tour to Jodhpur never disappoints any travelers. 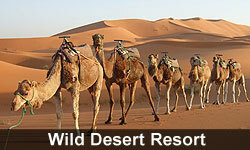 Located amidst the thorny vegetation and brittle yet awesome sand dunes, lies a grand fort above 120 meters. The city of Jodhpur is surrounded by 10-km long wall with eight gates. Here you can see a multitude of palaces, forts, temples and havelis, all celebrating the grandeur of Rajasthan. Observe the city flourishing with traditional lifestyle and festivity throughout the year. The city has an extreme type of climate with temperature range variation being very high. 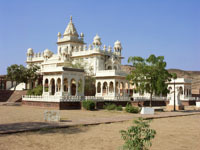 Thakur Surat Singh, of Kharda thikana, a small estate in Jodhpur pargana. was granted the estate of Khejarli in the same pargana, by Maharaja Abhai Singh of Jodhpur in 1726 AD, and he became the first 'Thakur of Khejarli' , though tragedy struck the village within four short years. Cenotaph of Bishnoi martyrs at Khejarli,who laid down their lives in 1730 AD protecting trees It is the place where Chipko movement originated in India. It was a Tuesday, black Tuesday in Khejadli. 10th day of the bright fortnight of the month Bhaadra according to Indian lunar Calendar, (September) in 1730 A.D. Amrita Devi a mother of three daughters viz. Asu, Ratni and Bhagu bai was at home with her daughters. Suddenly, she came to know that many people had descended in their otherwise sleepy village. It was a party of Giridhar Bhandari, a minister with Maharaja Abhay Singh, Ruler of Marwar (Jodhpur) state who wanted to fell the sacred green Khejri (Prosopis cineraria) trees to burn lime for the construction of his new palace. Since there was a lot of greenery in the Bishnoi villages even in the middle of Thar Desert, the king ordered his men to get the woods from Khejri trees. Devanagari:"Sar sāntey rūkh rahe to bhī sasto jān" (If a tree is saved even at the cost of one's head, it's worth it)  Saying these words, she offered her head. The axes, which were brought to cut the trees, severed her head from her trunk. The three young girls Asu, Ratni and Bhagu were not daunted, and offered their heads as well, and met the same end.\ Art By Vignesh The Prince Mass movement to protect trees The news spread like wildfire. Bishnois gathered and sent summons to 83 Bishnoi villages to come and decide on the next course of action. Since the supreme sacrifice by those four had not satisfied the royal party, and the felling of green trees was continued, it was decided that for every green tree to be cut, one Bishnoi volunteer would sacrifice his/ her life. In the beginning, old people voluntarily started holding the trees to be cut in an embrace as in the Chipko movement of 20th century in Uttar Pradesh (India). Mughal emperor Akbar was also not left untouched by the growing richness of Jodhpur; he ensured an alliance with the Rathore clan by marrying the sister of Rao Udai Singh. The history of Jodhpur includes the old city of Jodhpur that is fenced with a 10 km long wall with 8 Gates leading out of it and the new city that is situated outside the walled old city. Sir Pratap Singh, son of Maharaja of Jodhpur laid the foundation of modern Jodhpur. Marwar Festival is held every year in memory of the heroes of Rajasthan. The festival is held in the month of Ashwin (September-October) in Jodhpur, for two days during the full moon of Sharad Poornima. The only palace built in 20th century under the famine relief programme, has now been converted into a hotel with some parts being retained as a museum. The 19th century royal cenotaph is built in white marble, in commemoration of Maharaja Jaswant Singh. Some rare portraits of the rulers of Jodhpur are also displayed here. 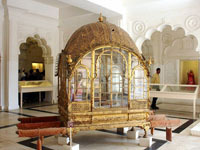 Recently the ruling family of Jodhpur has converted a part of the gigantic Umaid Bhawan Palace as the palace museum. Situated 9-kms north of the city of Jodhpur, is Mandore which, was the capital of Marwar prior to the foundation of Jodhpur.Today, its extensive gardens with high rock terraces make it a popular local attraction. The gardens also contain the cenotaphs of Jodhpur rulers. 65-km from Jodhpur, lie ruins of an ancient city called Ossian. This city is famous for Brahmanical and Jain temples, which belong to 8th and 11th century. Nestled in the vicinity of the city of Jodhpur, is the astoundingly scenic Sardar Samand Lake. The lake lies 60-kms south-east of Jodhpur off the Jodhpur-Pali route. This picturesque artificial lake is 7 kms from the main city. Summer palaces along the embankment and a bird sanctuary has made it a picnic spot. The Marwar Festival - Held in October, this festival brings alive the legend, folklore and romantic lifestyle of Rajasthan's rulers. The city is also well connected by the railway lines and trains are available for other major cities in the country from here. The 'Palace on Wheels' also visits this city of royal splendour. 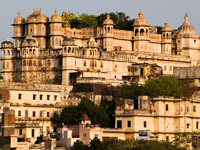 Jodhpur has its own airport and regular flight services conect the city with other major cities in and around Rajasthan. The state transport has bus services from other cities of the state and some services are interstate too. The best season to visit the city is between October and March when the weather is pleasant and enjoyable.